Compatible with the full range of DIN sized glass ampoules, the AO offers complete protection against sharps injuries at a starting price of $19.99/unit. 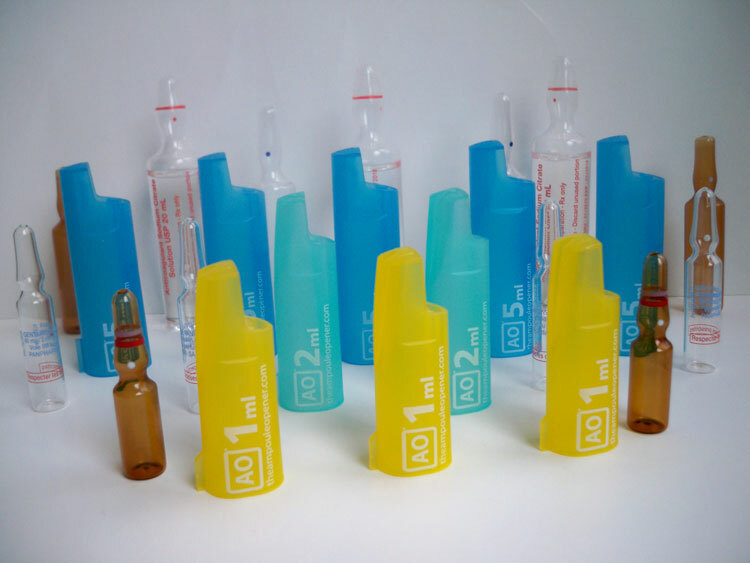 The AO is our original single piece ampoule opener available in the following sizes: 1ml, 2ml, 5ml, 10ml, and 20ml. 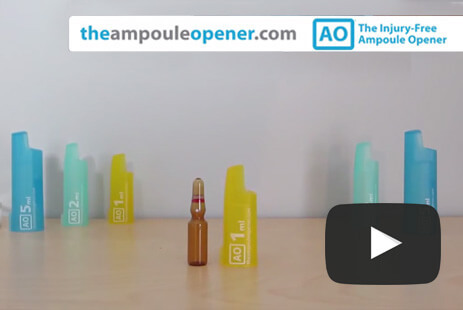 The AO+ is a next generation ampoule opener which requires no user contact with the ampoule during and after opening – thereby virtually eliminating sharps injuries. Each AO+, starting at $20.99/unit, is custom fitted to the specific ampoule you use, regardless of if it’s DIN, OPC, fully scored, or any other type so it works perfectly every time. Welcome to Innovation hub. We offer premium safety opening devices for use with glass ampoules, ampoule holding devices, safety needles, syringes and filter needles. Protecting our clients from sharps injury and needle stick injury is our highest priority. We look forward to making your experience a safe one. It is available in 1, 2 & 5 ml sizes, individually or as a kit. Prices start at $18.99. For all other sizes of DIN, OPC and full score ampoules see our other range of openers. 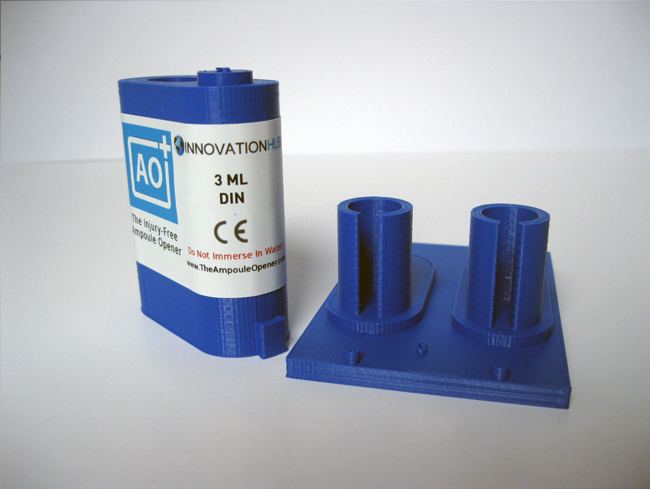 AOT is our NEW custom made version of the AO design , this can be made to suit your individual sized ampoule and supplied with or without a safety base. Custom made range can include sizes, from 0.5ml up to 30 mls. Each AOT is made to suit an individual sized ampoule only. Price will range from : $ 9.99 – 59.99 1-10 units, depending on complexity and size of your ampoule/s design volume discounts are available, contact us for a quote. AOP: Our Premium Safety Opening System. AO+ is a next generation safety ampoule opener, that is designed to completely protect the user from sharps and needle stick injury. AO+ use requires no user contact with the ampoule during and after opening – thereby virtually eliminating sharps injuries. Our optional needle holder prevents needle stick injury. AO+ is available in: Complete DIN AMPOULE sizing ( see DIN SIZING CHART) Full range of USA Wheaton ampoules; existing range of varied types of ampoules from our growing library of ampoules made and custom made units for your size and type of ampoule. Model pricing starts at $24.99 for small quantities. We can make units from 0.5 ml up to 30 ml sizes. Each opener is either individually sized or can be made to open ampoules of varying heights with the same base width. Contact us. Note: AOP is not a universal sized opener, it is sized for your ampoule. Need help selecting an ampoule opener? Measuring your ampoule is easy and will enable you to determine which ampoule opener will safely open your ampoules with consistency and ease. If you require a custom made opener, no problem. We can easily make one to suit your exact needs. Matching your ampoule with our openers. In order to find the right type of opener for your ampoule you need to Identify the type and sizing of your glass ampoule. This is easy to determine, click this button and we will guide you through this. If you already know this information, great, go to the different models and select the opener you want. See a brief over view of our range of safety ampoule openers. Filter needles, Safety needles and Syringes. We offer for purchase premium safety needles, syringes and Blunt filter needles and filter straws from the Millennium and Braun company’s. Blunt filter needles and filter straws: Individually sterile packed. Blunt filter needles or filter straws should always be used when removing drugs or compounds from an opened glass ampoule. The use of these devices prevents glass fines from being taken into the syringe and the possibility of injection into a patient. When opening glass ampoules there is always a risk of glass fines occurring, even though our openers are designed to limit this happening. Using filter needles or straws is a safety precaution that is always recommended by IH. We offer the full range of Millennium safety needles from gauges 18 up to 30, in lengths from ½ inch up to 1 ½ inch sizing, individually sterile packed. Syringes are the new Sole-care safety syringe, individually packed and in sizes from 1ml to 10 ml. Go to the buttons to for greater information and ordering. These link to corresponding pages and sections. The chart below compares the AO+ Ampoule Opener and our original AO to other ampoule opening options on the market. *Individual customization of the AO+ may be required. **ROI is achieved by lowering costs associated with fatigue and injuries. Chart below compares varied openers types. *Individual customization of the AO+ and AOT may be required. It is our absolute commitment to producing exceptionally safe and easy-to-use products that offer the greatest degree of protection to you, your staff, and the world over. Read more about our business philosophy.